ne of the world’s oldest religions, Zoroastrianism originated amongst Iranian tribes in Central Asia during the second millennium BCE and spread to Iran where it became the principal faith until the advent of Islam. Central to the religion is the belief in a sole creator god, Ahura Mazda, his agent Zarathustra (Zoroaster) and the dichotomy between good and evil. This two-day international conference was organised to coincide with the Brunei Gallery’s exhibition The Everlasting Flame: Zoroastrianism in History and Imagination. Throughout their long history, Zoroastrians have referred to and relied upon notions of what is traditional and authoritative in order to conserve their identity. This has been a process of reconnecting in every generation to what is received and recovered from the past – whether it be religious texts teachings and practices, or stories of past events both historical and mythical. However, tradition is not a simple or static phenomenon; it is ongoing, accumulative and responsive to the need for change in social and cultural contexts. Though now it is one of the smallest religious faiths in the world, Zoroastrianism is a microcosm of a great range of religious history, as it spans three millennia of changing conditions. For several centuries it enjoyed imperial patronage, and then for much of its history since the Islamic conquest, it was subordinated to the status of a minority religion in Iran, and was at times variously suppressed and tolerated, as it did not formally meet the requirements to qualify for the status of ahl-e ketāb. In India, since the early 9th century, the émigré community of Parsis enjoyed religious freedom, and in the modern period has achieved great economic success. Like many religious communities Iranian and Parsi Zoroastrians now form diasporic communities all around the globe. 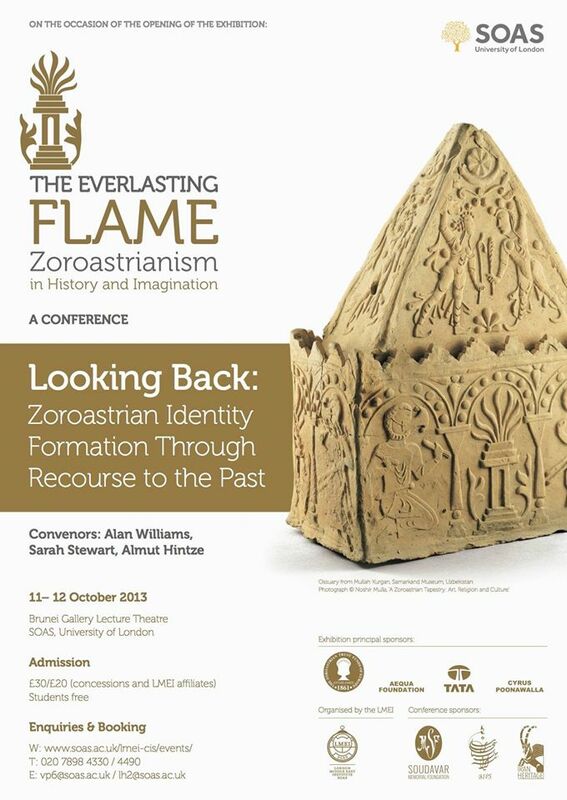 In this two day conference, speakers examined patterns of identity formation in ancient, medieval and more recent periods, looking at how texts, traditions, icons, rituals, stories and symbols have been used to form Zoroastrian identities. Participants in the conference were invited to consider the general theme with regard to one or more of key themes in their field of study, better to understand the processes of religious and cultural identity formation, continuity and development.